Around here, about 90% of people own a phone that runs on Verizon's network, since they have the largest coverage area and they have a monopoly on cell stores for 30 miles around. Meanwhile, I have a Tracfone which runs on AT&T's network, which has a great network out here that nobody uses. The other day I was being an educated customer and checking up on their coverage, seeing if anything new was going on. And to my suprise, AT&T is building up their HSPA+ network, and I am almost covered! I find that exciting, as Cellcom (a local carrier) has been working on a 4G LTE network but even they haven't gotten it built here yet. About a year ago, I started writing this post about 4G cell coverage in my area, but didn't finish it. Here it is. It was true then that while millions of Americans in large cities had HSPA+ and LTE service, the carriers still had poor rural roll-outs. 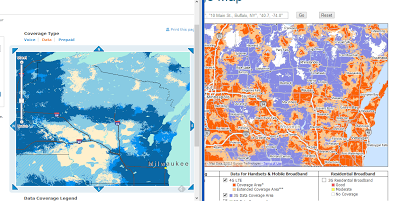 I am glad to say that AT&T has now overlaid their entire 3G network in Wisconsin to 4G HSPA+, which those data speeds are better than nothing. On the CDMA side, Cellcom's 4G LTE network just covers the fringe of where I live. Verizon does use this as extended LTE coverage for their customers...but there is still a "dead zone" waiting to be covered. All in all, I'm glad to see that mobile technology can and will still (ambit slowly) advance across the nation.